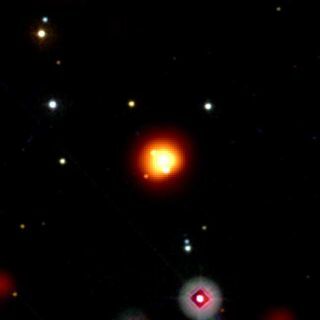 GRB 080913 exploded Sept. 13 at a whopping distance of 12.8 billion light-years away in the constellation Eridanus. his image merges the view through Swift's UltraViolet and Optical Telescope, which shows bright stars, and its X-ray Telescope, which captures the burst (orange and yellow). An explosion originating near the edge of the universe has been seen by an orbiting NASA telescope. The burst of gamma rays is the farthest such event ever detected. The blast, designated GRB 080913, arose from an exploding star 12.8 billion light-years away. It was detected by the Swift satellite and announced today. "This is the most amazing burst Swift has seen," said the mission's lead scientist Neil Gehrels of the Goddard Space Flight Center in Greenbelt, Md. "It's coming to us from near the edge of the visible universe." The universe is thought to be 13.7 billion years old. Seeing something so far away is effectively like looking back in time. The burst took 12.8 billion years to reach Earth and so is a snapshot of activity from when the universe was just one-seventh its present age. "This burst accompanies the death of a star from one of the universe's early generations," says Patricia Schady of the Mullard Space Science Laboratory at University College London, who is organizing Swift observations of the event. Gamma rays are the most energetic form of radiation on the electromagnetic spectrum, which also includes X-rays, visible light and radio waves. Gamma rays don't penetrate Earth's atmosphere and so have to be viewed from space. Astronomers on the ground followed up as well. Using a 2.2-meter telescope at the European Southern Observatory in La Silla, Chile, a group led by Jochen Greiner at the Max Planck Institute for Extraterrestrial Physics in Garching, Germany, captured the burst's fading afterglow in other wavelengths of light. This one was 70 million light-years farther than the previous record holder.